Press Release: Earlier this year, Haiti’s catastrophic earthquake caused widespread devastation and affected an estimated three million people. 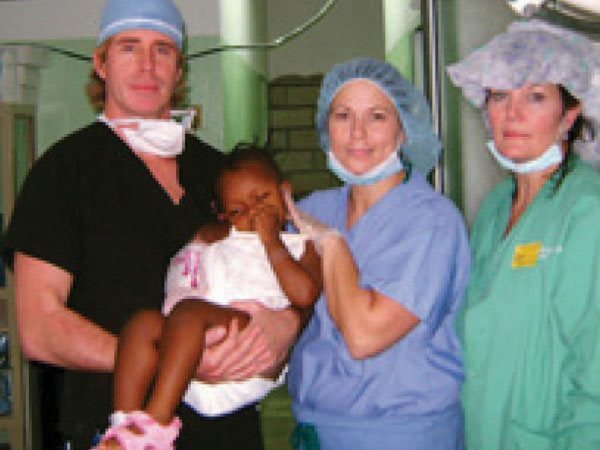 When Dr. Scott Runnels initially learned of the Haiti earthquake, he contacted The American Society of Plastic Surgeons to volunteer his services. Traveling to Haiti would be the first trip of this kind for him, but he believed this would be an opportunity to use his training and 20 years of experience to make a difference. On January 21, 10 days after the initial earthquake, Dr. Runnels volunteered for The LEAP (Life Enhancement Association for People) Foundation, a nonprofit organization comprised of physicians and nurses, which needed a team on short notice. Within 24 hours, Dr. Runnels assembled a surgical team and supplies and secured a jet that could fly to Haiti and return without refueling. Nurses Krista Swan, RN, Nina McLain, CRNA, and Jenny Mullen, RN accompanied Dr. Runnels to Haiti. The group that traveled to Port-au-Prince joined a surgery team whose work was already in progress. During their trip, the team did six to 10 surgeries a day successfully. Patients had suffered acute injuries to their extremities, and the pressure of being trapped under debris and buildings created infected sores. Patients were piled up on mattresses, blankets, cardboard or whatever they could find, six to eight patients per room, men and women, young and old. The Runnels team had to improvise in order to make sure that equipment was working properly and patients were given the correct treatment. The team made it home on January 31. This team went to Haiti because they could, but Dr. Runnels insists that for every person they were able to help, there was a person back home in the U.S. who had helped make it possible for the team to go to Haiti. You can read more in the May 2011 issue of the Northside Sun Magazine.